On Friday 25th June the band performed in concert along with renowned organ supremo, Stephen Hamill. The concert took place at St Peter's Church on Belfast's Antrim Road. The concert was organised by Stephen Hamill BSc LTCL, who, over the last 30 years, has taken an active part in the musical life in Northern Ireland both as a soloist and an accompanist to several of the province's leading choirs. He has also given solo recitals at venues such as Flexham Abbey in Northumberland, St. Paul's Cathedral in London and St. Patrick's Cathedral in New York and has accompanied services at York Minster, Exeter Cathedral and St. John the Divine New York. He has played with the Ulster Orchestra and the Royal Liverpool Philharmonic Orchestra and broadcasts regularly for both television and radio - over 100 broadcasts to date including a documentary for UTV in 1992 which followed him to St. Paul's Cathedral for a recital there. 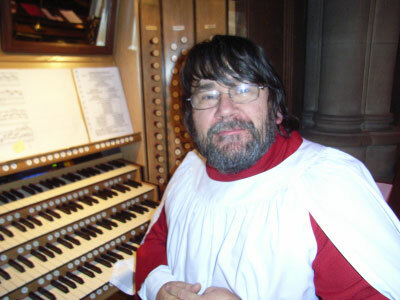 He is currently Director of Music at St Peter's Church and an organ builder by profession. The band had a wonderful evening and would like to thank Stephen Hamill and all at St Peter's Church for inviting us to perform to a very warm and supportive audience and look forward to a future concert here.